Patrick Hogan and Sir Tristram. When Sir Patrick Hogan accompanies his latest consignment of yearlings to Karaka in the final days of January 2018, the doyen of New Zealand’s Thoroughbred stud masters will be in his sixth decade of producing young horses for sale on the public stage. Give a man a horse: The remarkable story of Sir Patrick Hogan, by Dianne Haworth (revised edition). 432pp, HarperCollins – NZ. ISBN 9781775540960; ISBN 10: 1775540960. RRP $NZ39.99. Available as an Amazon ebook for $US11. Dianne Haworth begins his story by untangling the Hogan family’s Irish roots and we learn of Patrick’s upbringing on a dairy farm in the Waikato where the cows were gradually to give way to horses. So, from the selection and preparation of the little Jersey calf Neatness to win prizes at school Calf Club days when he was aged eight, we follow him to the world of breeding, preparation and parading of record-breaking Thoroughbred yearlings. All the well-documented highs and lows of his life are here – the purchase of his first mare (Nom de Plume) in 1959, his first Group One triumph as a breeder (Gay Poss in the 1970 Royal AJC Oaks Stakes), the search in the United Kingdom and France for his foundation stallion in 1976, and the initial negativity with which that choice was met. The book is full of facts, but it is also teeming with fascinating anecdotes drawn from the man himself and those who know him best – family, staff, friends and clients. The tireless, indefatigable figure of Patrick Hogan stalks these pages as vividly as he has the sales complexes of Australasia or the fields of Cambridge Stud. As his progress is detailed we are shown a picture of a hands-on, dedicated professional who made it to the top of this capricious world through hard work, innovation, originality of thought and meticulous attention to detail – all this, and maybe a little ‘luck of the Irish’ as well! But it is also a book about a horse. Sir Patrick has always emphasised the debt he owes Sir Tristram,the bay stallion of uncertain temperament (he was Irish, too!) 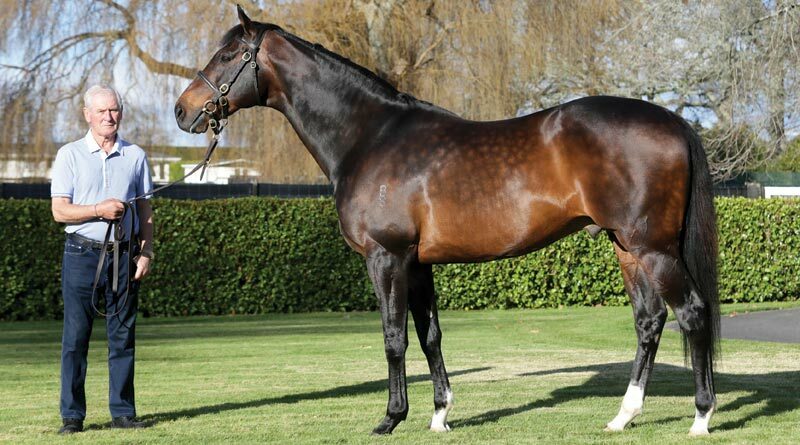 whose prowess and prepotency in the breeding shed established Cambridge Stud and the Hogan family as leaders in their field, and whose son Zabeel ensured their future, for both were breed-shaping sires and their legacies will be far-reaching. Dianne Haworth has written an engaging biography – this was a story begging to be told – and this revised edition is most timely , for along with Sir Tristram and Zabeel, it includes the latest star of the Cambridge stallion ranks, Tavistock. Can lightning really strike thrice? Patrick Hogan and Cambridge Stud’s Tavistock.